During the administration of Mayor Fred J. Smith, twenty-two acres of barren sand dunes along the lake front were purchased from the Forsythe estate for $75,000. In two years, the Mayor converted this land into the city park. According to the 1924 Whiting Reflector, “Hundreds of loads of rich loam were shipped here to cover the sand hills and to furnish a foundation for the lawns, trees, and shrubbery. Thousands of dollars have been spent on the improvement of this park, until it is now one of the most beautiful in this region. 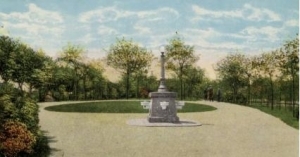 It has a bathhouse, tennis courts in summer, skating pond in winter, baseball diamond, play ground for the children, band-stand, and dance pavilion.” To this day, the park is visited by people from all over the Calumet Region. People come every summer to listen to the sweet sound of the Symphony in the Park, a practice that has continued since the park’s construction. Groundbreaking for a multi-million dollar renovation of Whiting’s lakefront park was held in June 2010. Whiting’s Mayor, Joseph Stahura, and Congressman Peter Visclosky were among the officials welcoming the public to the groundbreaking ceremony unveiling the Whiting Lakefront Park Redevelopment, expected to establish Whiting as a center for commerce and tourism. In 1923 Standard Oil provided the site and $30,000 for the erection of a community house. The building served as a memorial to the Whiting soldiers and sailors who served in World War I. John D. Rockefeller contributed an additional $100,000, and John D. Rockefeller, Jr. added $50,000. Standard Oil wanted to make it clear to Whiting that the company was making its gift as a citizen of Whiting, not as an employer, and that the planning, erection, furnishing, and administration would be in the hands of the citizens of Whiting. The final cost of the Community House was $550,000, and it had an auditorium, social and reading rooms, a gymnasium, swimming pool, billiard rooms, and other facilities for cultural and recreational activities. The beach has not always been known as the Whihala County Park. 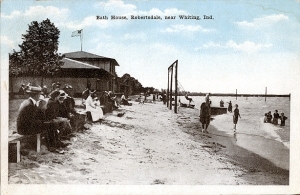 It used to be called the Whiting Beach. During this time, there were giant swings that overlooked the water. Children and adults would spend the summer days swinging over the tide and counting the days left of their vacation. The swings were eventually taken down, probably to prevent accidents, and all we have left are the memories. In 1981, the Lake County Parks and Recreation Department opened what is known as Whihala Beach. The name Whihala stands for three local government entities: the cities WHIting and HAmmond, and the LAke County Parks Department. Today, you can take advantage of a trained staff of lifeguards, full concession stand, restrooms, showers, fishing pier and a boat launch. The City of Whiting reacquired the beach from the Lake County Parks Department in June 2010. 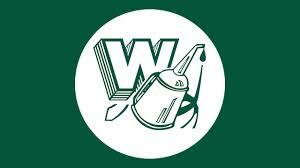 Whiting had its share of associations, organizations, and clubs to keep its citizens busy. In 1894 the Fortnightly Club was organized by several women who were interested in art and literature. According to the 1924 Whiting Reflector, “At first the number was limited to twenty-five, but later this restriction was removed.” The name was changed from the Fortnightly Club to the Whiting Woman’s Club when the State Federation of Women’s Clubs was established. 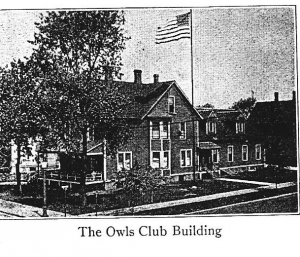 Another such organization was the Owl’s Club. This association was formed for young men. 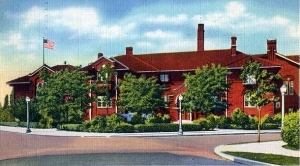 The clubhouse was on the corner of Pennsylvania Avenue and 119th Street, the present site of the Elks. The 1924 Whiting Reflector states, “Since its organization in 1893 it has been an important part of the social life of its community.” In 1969 Whiting had forty six clubs or associations that members of the community could join. To the right are pictures of some of these organizations.